Waiting on Wednesday is a weekly meme hosted by Jill at Breaking The Spine. It showcases each blogger's most anticipated books. 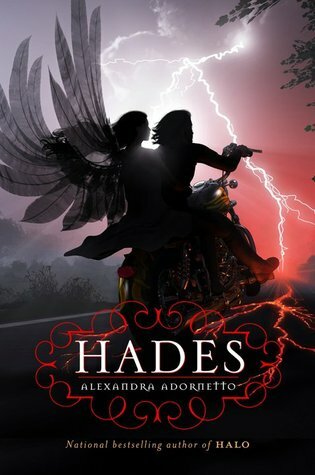 This week, my pick is Hades, the sequel to Halo, by Alexandra Adornetto. Summary: "Even the love of her boyfriend, Xavier Woods, and her archangel siblings, Gabriel and Ivy, can’t keep the angel Bethany Church from being tricked into a motorcycle ride that ends up in Hell. There, Jake Thorn bargains for Beth’s release back to Earth. But what he asks of her will destroy her, and quite possibly her loved ones as well. Can he be trusted in this wager? And what does Jake have Xavier believing about Beth’s fate that may result in an act of betrayal that will leave Bethany – and readers – wondering if Xav is so good after all." Why I Can't Wait: Around the blogosphere, you're going to hear a lot of mixed reviews when it comes to Halo. I personally adored it. I thought it was fun, romantic, sweet, and exciting in all the right places. While I like Xavier, my personal hero was Gabriel. Love me some Gabriel! Anywho, with the way Halo ends, I couldn't help but be excited for Hades. I'm curious to know where Alexandra will take these beloved characters and how far she'll push them. Juju from Tales of Whimsy also liked Halo. I'll say they have beautiful covers. I have heard mixed reviews about Halo which is why I haven't read it yet. I don't think I am in the mood for anything romantic at the moment. But I am happy to hear you enjoyed it ^_^. Oh gosh, Halo. No words. BUT, she will be at Austin Teen Book Fest this year! I am one of the people that did not like Halo.. at all. I wanted to. I really did. But it just didn't do it for me. I haven't read Halo.... Is it good? ?